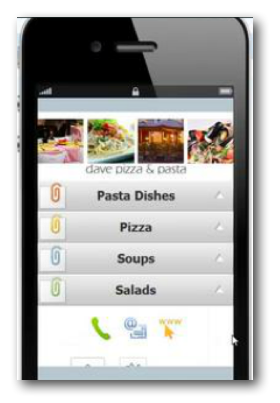 These days, most people looking for casual dining will turn to their mobile phones for information. We’ll help you create a mobile experience that will give your potential customers just the right information when they need it. Your site will be viewable on most smartphones, including iPhones and Androids, with content still available to those with not-so-smart devices. You’ll get a report in PDF format each week showing: website conversions and interactions (and phone calls, payments, form submissions and leads with optional modules described below), as well as page views and unique visitors. Panel menus make it easy for customers to find what they're looking for. Coupons are delivered right to the user’s mobile device. Set redemption limits, like: once per customer, multi-store redemption (GPS-enabled), and more. Gain Facebook fans by offering coupons, only if they “like” you. Create signup forms to collect contact information for later promotions, whether that’s for emailing, contests, surveys or newsletters. You can make it a requirement that the user fill out a form before receiving their coupon. We can automatically send your forms to email marketing programs, like Zoho, Mailchimp or ExactTarget, as well as export leads in an Excel format (data fields may be custom-tagged). Sell products directly through your mobile site via a credit card or a PayPal account. Set your “Thank you” or “Cancel” pages to redirect customers after checkout. Choose from any of the following.